Taxpayers will run into an alphabet soup when they go to their tax preparer this spring. Tax credentials validate a preparer’s experience and expertise. Find out which ones your tax preparer has and check them out. Having credentials typically requires passing exams, abiding to a code of ethics and taking a minimum amount of continuing education (CPE) every year. 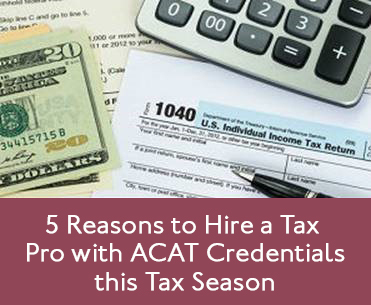 In addition to credentials that taxpayers might already know, such as “CPA,” many other combinations of letters can tell you a lot about the expertise of the person who prepares your tax return. Certified Public Accountant (CPA): This is a widely recognized credential for tax preparers and accountants. Each state has its own Board of Accountancy responsible for licensing CPAs who practice in that stateand each board issues rules that govern what a person must do to become a licensed CPA. Many CPAs specialize in accounting as opposed to tax returns, so it is important to ask about recent experience preparing tax returns and whether they are current on the latest laws in an ever-changing tax environment. Enrolled Agent (EA): EAs have passed a three-part IRS exam covering individual and business tax returns, and must adhere to ethical standards. They must also complete 72 hours of continuing education courses every three years. Perhaps most significantly for taxpayers, EAs are authorized to represent taxpayers before the IRS. IRS Annual Filing Season Program – Record of Completion Holders – The Annual Filing Season Program (AFSP) is intended to recognize and encourage the voluntary efforts of unenrolled tax return preparers to increase their knowledge and improve their filing season competency through continuing education. AFSP – Record of Completion Holders must meet annual educational requirements set by the IRS and either take and pass an annual tax refresher course or have passed other IRS recognized state or national competency tests such as Accredited Business Accountant and Accredited Tax Preparer (read more on ACAT credentials below.) Annual Filing Season Program participants have limited representation rights, meaning they can represent clients whose returns they prepared and signed, but only before revenue agents, customer service representatives, and similar IRS employees, including the Taxpayer Advocate Service. These practitioners can handle sophisticated tax-planning issues, including planning for owners of closely held businesses, planning for the highly compensated, choosing qualified retirement plans, and performing estate tax planning. Their expertise covers tax returns for individuals, business entities, fiduciaries, trusts and estates, as well as tax planning, tax consulting and ethics. These practitioners have a thorough knowledge of the existing tax code and the preparation of individual tax returns. Their expertise covers comprehensive 1040 issues, including supporting schedules and self-employed returns, and ethics. ATP credential holders are exempt from the IRS Annual Tax Refresher Course and exam and qualify for the AFSP Record of Completion. ACAT’s designation for Accreditation in Accountancy, the ABA is a prestigious professional accounting credential that demonstrates to clients, potential clients and employers that the credential holder has a thorough knowledge and proficiency in financial accounting, financial reporting, financial statement preparation, taxation, managerial accounting, business law, and ethics for small- to medium-sized businesses. ABA credential holders are exempt from the IRS Annual Tax Refresher Course and exam and qualify for the AFSP Record of Completion. This credential recognizes professionals who have a thorough knowledge of topics relevant to retirement planning and special issues of senior citizens including tax planning and tax preparation for decedents, estates, and trusts; and applying your knowledge and skills in real-life situations when serving aging clients. After selecting a tax preparer, make sure you know who is handling your return within the firm, because the best credentials in the world won’t help if the professional who holds them does not actually work on your return.